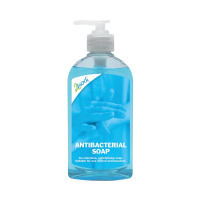 This antibacterial hand soap from 2Work leaves hands clean, moisturised and free from bacteria. The antibacterial hand soap is ideal for use in food environments, kitchens, canteens, nursing homes and hospitals. This pack contains six 300ml pump dispenser bottles of hand soap.